COST: $40 ($20 student rate, any school with student ID). Payment is cash only at the door. (Yale Club members may charge accounts $35 in advance to attend). Includes an open bar of beer, wine, soda and juice plus many food buffets. RSVP: Required for entry. Free to RSVP (only pay if you attend). RSVP Link: http://goo.gl/XBF7dt . RSVPs CLOSE Midnight on Thursday 4-16. Catch up with old friends at meet new ones, at the 7th annual LBT Women’s Mixer at the beautiful Yale Club of NYC. We will be in the Grand Ballroom (floor 20), the largest room at the Club, with beautiful neoclassical architecture, an ornate, decorative ceiling and nice city views. 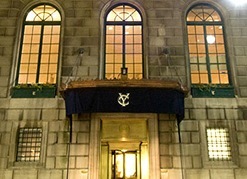 The Yale Club is the largest Private Club in the world. Last year over 400 women RSVPed and 275 women attended. Enjoy an open bar (beer, wine, soda & juice) – and a bounteous buffet of hors d’oeuvres (hot and cold, including a 3’ tall chocolate fondue fountain, fruit, vegetables, cheese, dessert, meats and more) while you mingle. We invite women from Yale, the Ivy League, Seven Sisters, Stanford, NYU, Duke, UVA, Georgetown , Williams, Amherst, UCLA, University of Chicago, William and Mary and their smart friends from any school for this spectacular evening! Everyone is welcome to attend. FFR/Princeton BTGALA, HGSC (Harvard), Columbia Pride, CUGALA (Cornell), NYU LGBT Alumni Network, DGALA (Dartmouth), Stanford Pride and Brown TBGALA (co-host list in formation) – and to our organizing host for the evening: Yale GALA (www.yalegala.org) and Natasha of Yale GALA. Advance RSVP Requested. RSVPs are NOW OPEN. RSVPs close Thursday April 16 at Midnight. (There is no cost to RSVP; payment is cash at the door, and only pay if you attend).